My goal here is to have something fun (and hopefully educational/thinky) (and yes, I did just make up the word thinky, live with it) at the end of each month. So this month it’s a puzzle. Calculate the first 10 prime numbers. A Prime Number can be divided evenly only by 1, or itself. And it must be a whole number greater than 1. Should be able to easily extend the solution past 10. i.e. if I asked you to come up with the first 20 prime numbers it would require minimal changes to your code. This is T-SQL. Set based is always preferable over RBAR (loops). FYI this can be trickier than it sounds since technically things like recursive CTEs are actually RBAR behind the scenes (as I understand it). The simpler the code the better. 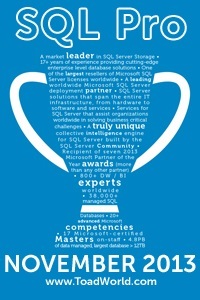 If you aren’t a junior DBA, write it so that one can read it. Comments as necessary. If your code is anything above junior level then it needs comments. It’s good to get into the habit even in simple code. -- Check to see if there are any numbers that evenly divide in. Now the down side here is that my numbers table has to be big enough to cover any number I’m going to test. Eventually that could require a pretty large numbers table. I’ll leave it to you to decide if that’s important or not. Here is a half baked Sieve of Eratosthenes approach. Your numbers table doesn’t need to have anything divisible by 2,3,5 or 7.. so it can be 80% smaller. — Check to see if there are any numbers that evenly divide in. Fixed and modified to work in a case-sensitive environment 🙂 Nice job! It’s still limited by the size of spt_numbers though, right? You know prime numbers are never even, so that could also limit what you need in your table and speed things up. One small remark: You shouldn’t be doing SELECT TOP n without an ORDER BY… you’ll get 10 prime numbers here, but theoretically it might be ANY 10 prime numbers, not necessarily the first 10. Since I don’t really like rCTE’s I tried to do the same using a loop where I delete the multiples of a given number and then go on to the next number etc.. works remarkably well! For fun I added the ‘pre-filtereing’ as suggested by @denisgobo but IMHO that’s cheating =) Then again, it does wonders for the looped version! Nice! I really like that method! I’m a firm believer in known all the tools, use all the tools where appropriate 🙂 Generally (IMHO) the problem with things like rCTEs is that people use them poorly. A bit off-topic here, but I’m pretty sure someone else made that word up, too. This is really cool! I’ve never seen a prime calculator written in SQL. Neat!